Nearly every kid with access to some paint and paper has created what an art critic might call an “abstract” work of art. So why is it that the eight-year-old Australian abstract expressionist, Aelita Andre, has garnered so much more attention than the average kid artist? The answer to this question is twofold, and the first part is as simple as the latter is complex. To begin, Aelita has had an enormous amount of support from her parents, Michael Andre and Nikka Kalashnikova. A cinematographer and photographer respectively, Aelita’s parents have provided her with more than just some paint and paper; they’ve given her access to her own studio and a seemingly endless supply of painting materials. In addition, it was their connections within the Melbourne art industry that initially shined the spotlight on Aelita. When her daughter was less than two years old, Kalshnikova presented some of Aelita’s works anonymously to Mark Jamieson, the director of the Brunswick Street Gallery who represented her own photography. Impressed by the works, Jamieson decided to exhibit them alongside Kalashnikova’s. When he later discovered Aelita’s identity, Jamieson was hesitant, but continued to advertise them anyway. From then on, her fame only grew. 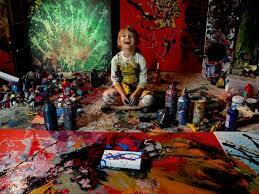 At the shockingly young age of four, Aelita landed a solo exhibition at the Agora Gallery in New York City. This brings us to the second part of our answer. Though Aelita has had substantial parental support, not every privileged kid gets his or her own solo exhibition in the center of the art world. Aelita has seen such great success because her paintings are extraordinary in their own right, and they’ve been labeled so by the art world time and again. Even to an untrained observer, the mixture of colors, shapes and textures in Aelita’s paintings elicits a powerful subconscious response. And it doesn’t take an art critic to discern the compelling consistency of her dreamlike aesthetic. But in today’s art industry, it’s the opinions of the trained observers that count. The philosopher, Arthur Danto, made this point clear in his groundbreaking essay, The Artworld, which laid the theoretical underpinning for contemporary art. Danto asserted that a work of art does not possess value in and of itself, but is instead assigned value by its social context. So, it’s the giant institution of critics, curators and collectors—or, in Danto’s words, the “persons acting on behalf of a certain institution”—that made Birch Forest in Space, Aelita’s highest-valued painting to date, worth $50,000. Because of Aelita’s widespread critical acclaim, her father thinks that she is “reinstating the important position of art made by children.” In other words, little Aelita has been taking on the giant art world and illustrating that children too can make a valuable impact. In spite of of her increasing success, Aelita paints because it’s what she loves to do. When speaking about inspiration for herself and other aspiring artists, Aelita suggests, “you can’t inspire anyone…they need to find it in their heart themselves.” The moral of the story: with a little parental support, your passion, if and when you find it, has the potential to color the world with change. Aelita landed a solo exhibition at the Agora Gallery in New York City.